Perfect Prep EQ Extreme is quick acting, targeted calming support for increased focus during stressful situations. Use 90 minutes before increased stress. Effects begin within 1 hour and last up to 6 hours. May be used alone or in combination with the Perfect Prep Calming System (Perfect Prep EQ Gold and Perfect Prep EQ Training Day). Contains no prohibited substances. 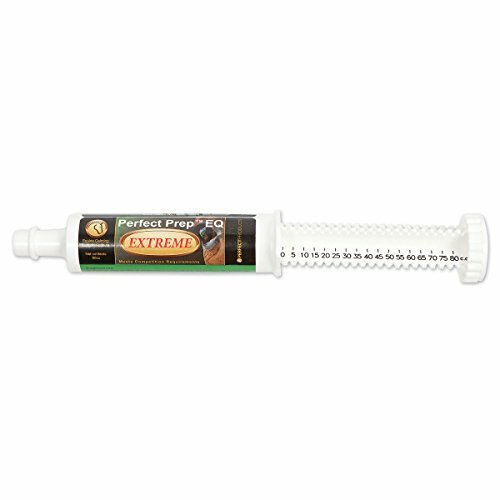 Read more about Perfect Prep EQ Extreme. Suggested Use: For maximum effect use 80cc (one full oral syringe) 90 minutes prior to activity. Adjust for desired results. Effects begin 1 hour after administration and can last up to 6 hours. Feed carefully to assure swallowing. Flows best at room temperature. Tips for Best Results: Because every horse has unique challenges, we've created a system of calming formulas to help you bring the very best horse to your performance every time. Use Perfect Prep EQ Extreme alone or as part of the Perfect Prep Calming System. We strongly encourage you to evaluate the effects Perfect Prep EQ before your event to find the best product or combination of products to suit your horse's needs. For an even greater calming effect: Use Perfect Prep EQ Extreme in combination with Perfect Prep EQ Gold and/or Perfect Prep EQ Training Day as part of the Perfect Prep Calming System. If you have any questions about this product by Perfect Products Equine, contact us by completing and submitting the form below. If you are looking for a specif part number, please include it with your message.